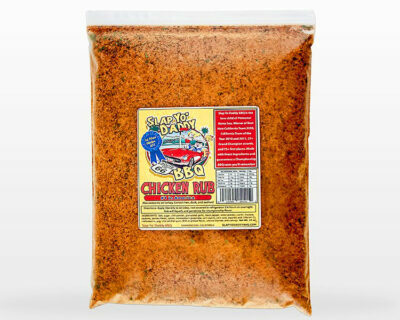 I’m very excited to announce the sale of my Competition Chicken Rub! It’s available exclusively at one of the most popular Internet BBQ websites called BigPoppaSmokers.com. Sterling Ball, the owner of Big Poppa Smokers is a good friend and agreed to carry my rub on his site for 60 days before it becomes generally available elsewhere. My chicken recipe has been a work-in-process for five years and in 2010, I finished 3rd overall in the Kansas City Barbecue Society (KCBS) chicken category. 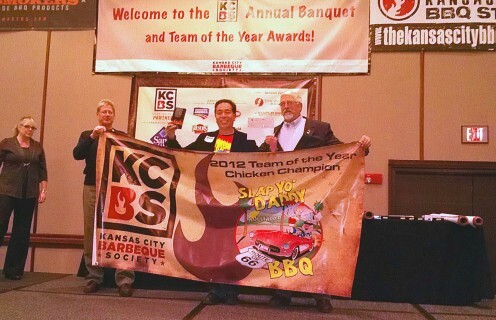 I continued to improve my formula and in the 2012 season, Slap Yo Daddy won the KCBS Team of the Year (TOY) Chicken Champion. Check out what Über food bloggers are saying about my new rub . 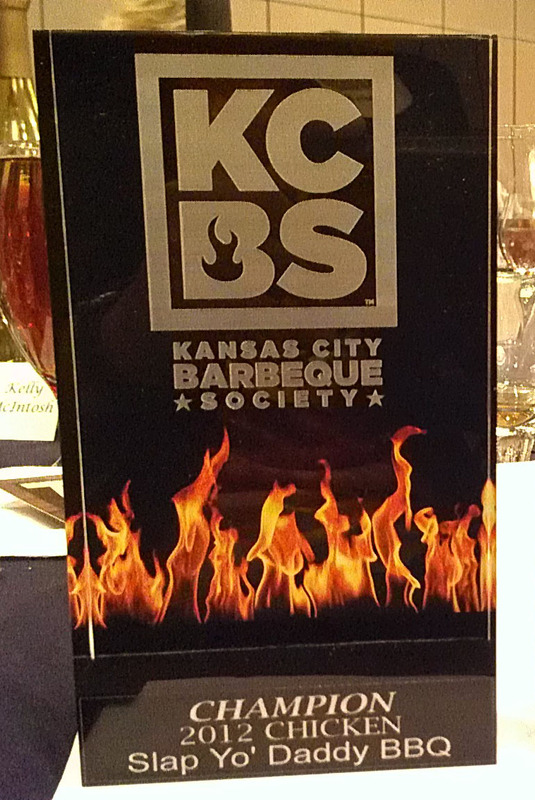 . .
At the KCBS Awards Banquet in Kansas City on January 19, 2013, I received a huge 10 X 4 vinyl Chicken Champion banner with my team name and logo prominently shown in the front. I also received a beautiful acrylic trophy with flame design. There are 5,000 to 6,000 competition teams in the country and many teams cook terrific chicken so a first place standing is huge. I got to first place in 2012 by winning 4 first places and 2 second places in this best-of-ten KCBS points contest for this category. 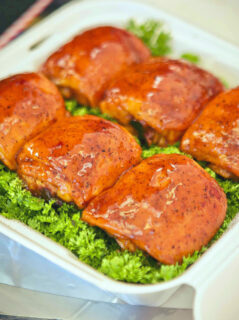 For 2012, my goal was to cook the most amazingly tender and delicious BBQ chicken ever made. This particular rub formula carried me to a first place chicken at the Lake Havasu contest in early 2012 against 74 teams. I missed a perfect 180 scored by less than one point (179.4286 of 180). After that, I also won first place chicken at the Country Music Awards contest at the Mandalay Bay in Las Vegas with almost a perfect score against 111 teams (179.4286 of 180). It was no coincidence that I was also crowned Grand Champion at both large events, in part thanks to my tasty bird recipe. By the end of 2012, I continued to walk up to podium often this meat category. 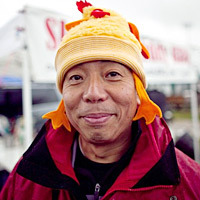 On cold contest days, I would wear my signature chicken hat for good luck. I’ve been asked by many of my students and competitors alike about sharing the secret of my success which is the special rub I custom formulated to win in this category. I’ve held off adding my competition chicken rub to my line of Slap Yo’ Daddy rubs because I was trying to win first place in America. Since I’ve accomplished my Bucket List goal, I’ve decided to share my rub with the world. For the past several months, I’ve been working with my rub business partner, David Sievers, of Soupbase.com who manufacturers and distributes my products to replicate my winning formula into one composite competition chicken rub. After numerous tests and field trials, we perfected the formula and now you can try it! In case you’re wondering, this is my actual competition chicken rub that will enhance the flavor, texture and appearance of the poultry that you cook for a championship result. Try my rub and apply it liberally on all sides (I put a lot of my rub on my chicken in contests) of your poultry (chicken, turkey, Cornish hen, duck). There is no need to apply it underneath the skin or use it with any kind of brine or marinade. For best results, do what I do which is to let your meat rest in the refrigerator for 2-4 hours or overnight. In competition, I put my rub on at 10 pm Friday night, refrigerate it, and cook it on Saturday for a noon KCBS chicken turn-in time. Once the rub penetrates your chicken, it will look wet and tacky. Be sure to touch up any spots where the rub fell off mid-way through your cook. Apply your favorite barbecue sauce before serving. Be sure to thin your sauce so it does not go on goopy. You can also heat your sauce slightly so it goes on smoothly. Watch the brush marks as you want to turn in pristine chicken in a contest. When you utilize my rub correctly, the meat should be juicy and the flavor will be sweet with some kick. 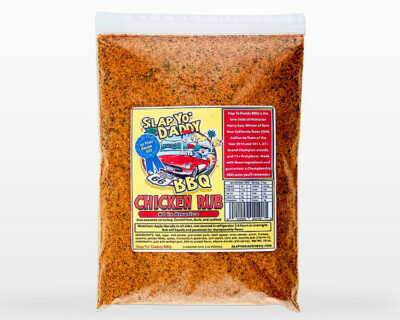 I have really enjoyed smoking chicken this year and I hope to share this wonderful experience with you by releasing my award winning Slap Yo’ Daddy Competition Chicken Rub. I just placed my order for the three rubs and cannot wait! By the way, do you have certain bbq sauces you use for the different types of meat? Do you use a mustard based one chicken? I don’t use mustard sauces. Try some of your fav barbecue sauce with some honey and hot sauce mixed in. I am looking for a good rub for brisket and one for ribs. Something popular in Texas…. Try my Moola for brisket (1st in KCBS Ranchers Reserve Cup USA). For ribs, teams are walking with my chicken rub on the meat side and All Purpose on the bone side of ribs. We have an MSG HOT version popular with competitors. The bottle packaging does not have MSG and is not as hot. Thanks for your business.